Many times, when our electricians go on a service visit for an electrical issue in Lino Lakes, they walk through the customers front door and stroll into the aftermath of a light fixture replacement / DIY project gone awry. The smell of a short circuit is still in the air and the new light fixture is usually sitting on the floor as electrical wires point out sharply from the ceiling. At Edison Electric, we know our DIY customers are well meaning people who are just trying to get stuff done and sometimes bite off a little more than they can chew. Sometimes a simple light fixture change-out isn’t as easy as it looks; especially when the original wiring is questionable or isn’t identified properly. The simplest of DIY electrical tasks can spiral into large electrical problems quickly when home electrical repair experience is short. But never fear – Edison Electric is here! 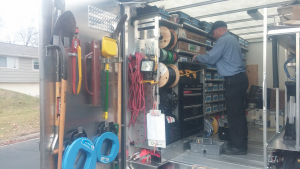 Our electricians have the experience, tools and training to put your DIY train back on the tracks. We arrive at your home in fully stocked service vehicles so we can handle any home electrical situation quickly and properly. Our customers really like our upfront pricing and easy-going, hassle free approach to home electrical service. All of our electricians are state licensed professionals who care about fixing your electrical problems. So when your DIY project doesn’t go as planned, pick up the phone and give us a call 612-385-7864. We’ll make it right! Bringing all the tools and parts to your front door!